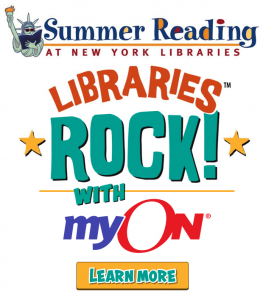 In partnership with and in support of Summer Reading at New York Libraries, myON will be providing free, unlimited 24/7 access to myON’s Digital Library and Middle School Classics for children from Birth through Grade 8. Access will be available from May through September 2018 for students and families with young children through both their schools and public libraries. Students that already have a myON login will continue to use that login to access the myON digital library and continue reading throughout the summer. For more information, including username and password credentials, click here.